for their heroic actions on 21st April 2015 during the Mission Courageous Restraint. The NATO Meritorious Service Medal is awarded to commend NATO staff whose personal initiative and dedication went beyond their duty to make a difference both to their colleagues, and to NATO as an organisation. 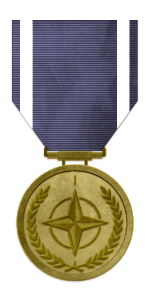 In addition the Medal is awarded for performance of acts of courage in difficult or dangerous circumstances; showing exceptional leadership or personal example and making an outstanding individual contribution to a NATO operation. 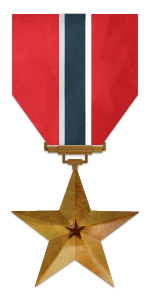 For his heroic actions in providing covering fire for two colleagues pinned down by an overwhelming enemy force whilst defending his own position and relaying critical information to Company HQ throughout until the QRF and sister platoon Spartan could arrive. For their heroic actions in attempting to recover their wounded and trapped colleagues, subsequently finding themselves pinned against overwhelming numbers and eventually making it to safety. of their role and maintaining a regular training regime. Demonstration of exceptional skill in combat, by supporting the platoons within Tombstone. and displaying dedication to his fellow soldiers. For his strong leadership skills and dedication towards his platoon and sections. For development of skill, and their continued dedication and role in Storm. For his dedication, support and leading of Storm. The community and myself would like to thank you for all the hard work and effort you have put in to make this community stronger. As we now move on to expand our community. A strong, professional and truly dedicated integral part of this community has shown all of us what we can aspire too. We all owe you a great thanks for the effort you have put into this community. With out all of you we could not have accomplished all that we have over the duration of time Reach has been alive. I say alive as it truly is with everyone's input and values converged into one community. So a special thank you to you all for your continued support. So we have been rather quiet with information coming from the staff in the last few weeks, so here is a general catchup with what has been happening.